Copper is a soft, non-ferrous metal that can be easily bent, cut, shaped and joined using several welding processes. While it is often used to make decorative household and architectural items, it is an excellent conductor of electricity and heat, and so is widely used in the electrical industry, while copper pipe, valves and other fittings are commonly used for plumbing. Since it is ductile and highly malleable, copper is also used as the major element in hundreds of different alloys, including brass, bronze, and nickel copper. The most common alloying elements used for copper alloys are aluminum, nickel, zinc, tin, and silicon. Because pure copper is too ductile to be successfully machined, small quantities of other elements are added to the various alloys to improve machinability, as well as to deoxidize the metal, make it more resistant to corrosion, improve its mechanical properties, and improve its response to heat treatments. In all there are more than 300 copper alloys available commercially. Copper and most copper alloys can be successfully joined using welding, brazing or soldering processes. The exact process chosen depends largely on whether you are welding pure copper or an alloy. If you are welding an alloy, the alloy elements will determine which process is used, as well as all the other factors one takes into account when welding, including filler material used. Of course, the different welding and related processes require different tools and techniques, and it’s important to learn the skills required for which process you need to use. Soldering, which is one of the earliest methods used to join metal, involves heating filler metal (in the form of a filler wire) so that it melts and fills joints. Soft soldering is the simplest process, and the one commonly used in and around the home to repair small metal items. It is also the method used by plumbers to join and repair copper pipe and copper fittings. You can use an inexpensive soldering iron or a blowtorch with a suitable flux for soft soldering. Hard soldering involves heating the filler materials to a much higher temperature, so the joint will be a lot stronger than other soldered joints. The filler material is different and usually contains silver, so the technique is often referred to as silver brazing. However, true brazing is executed at an even higher temperature. Brazing is essentially a technique similar to soldering, and it utilizes the same sort of filler material (wire or a brazing rod) used for soldering. Joints need to be very closefitting so that capillary action can draw the filler metal between the pieces of copper being joined. Even though temperatures used must be considerably higher than those required for soldering, the base metal mustn’t be heated to melting point. 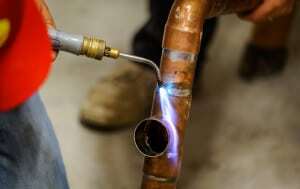 Used extensively for plumbing work, brazing may also be used to join different types of metal as well as metal work pieces that are different thicknesses. Welding, or more accurately arc welding, incorporates a number of different more specific techniques. Generally, the welding processes that utilize shielding gases are preferred, though shielded metal arc welding (SMAW) which is also commonly referred to as manual metal arc (MMA) welding can be used for applications that are not critical. It is a useful method for a variety of copper alloy thicknesses, especially since covered electrodes for welding copper alloys using SMAW are available in a wide range of standard sizes. The shielding gases normally used for welding copper and copper alloys are argon and helium, or mixtures of the two – for either gas metal arc welding (GMAW), gas tungsten arc welding (GTAW), or plasma arc welding (PAW) which is particularly popular for welding copper alloys. Generally argon is preferred if the copper or copper alloy is welded manually and either has a relatively low thermal conductivity, or is less than 3.3 mm (0.13 in) thick. Helium or a helium (75 percent) argon mix is preferred for machine welding thin sections, or manual welding of thicker sections. This mixture is also recommended for thicker metal or copper that has a high thermal conductivity. • Whenever possible use the flat position for arc welding copper. • GTAW and SMAW can be used for welding in other positions, including overhead. • If welding in vertical and overhead positions using pulsed power and small-diameter electrodes, GMAW may be used with some copper alloys. • Thermal expansion of copper and its alloys, as well as its higher thermal conductivity, do result in greater weld distortions than when welding mild steel. • To minimize distortion and warping, welders need to focus on correct preheat processes and tack welds, as well as following proper welding sequences. The melting point of copper and its alloys is hugely variable, but it is at least 1,000 °F or 538 °C lower than the melting point of carbon steel. Also, copper doesn’t exhibit the same sort of heat colors seen when steel is welded, and when it melts its fluidity is much greater. The Copper Development Association (CDA) Inc. that has established an alloy designation system widely used throughout North America, has a huge amount of information about welding copper and copper alloys for anyone wishing to learn more.